Though I’ve been cooking for as long as I can remember, fish has always left me feeling like a cooking imposter. I couldn’t even take a strong stand and claim to loathe it; I just never really got what all the fuss was about. For years, I’d try a bite every six months or so—when my mom cooked it, or a friend ordered it in a restaurant and rolled her eyes in bliss. Still, appreciation eluded me. 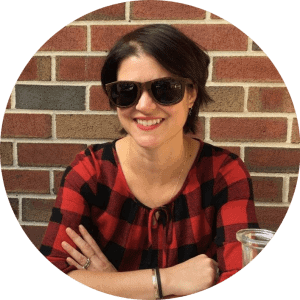 The few times I ordered fish, determined that this would finally be the time, it was okay, but it left me feeling unsatisfied—like I wanted to order dinner all over again. This year, though, I got pissed off. Fish is so versatile; it’s such a great source of protein; it absorbs flavor so well. And, finally, the kicker: as someone who lives alone and likes to cook every night, the fact that fish fillets are so easy to buy in single-serving pieces (and cook much more quickly than meat or poultry) is what finally made me determined—goshdarnit, I was going to learn to like fish or else. My mother, who’s a great cook, makes fish often, so I knew she was a good source of knowledge on the actual how-to of it all. More importantly, bless her heart so like my own, my mom loves to experiment. So when I went to her with my challenge—help me learn a way of cooking fish that I like—she went into full-on Marie Curie mode. She said we’d start with tilapia because it’s mild and inexpensive enough that I could actually afford to eat it if I ended up liking it. We decided we’d try two preparations: one poached, one grilled, and each with a different flavor profile. I guess if we were America’s Test Kitchen we’d have done each type both ways, but hey, I was the only one eating it. I thought the poached tilapia would be delicious, the liquid covering up what I assumed would be a slimy fishiness. Instead, it was the opposite. I hated the poached fish; found it mushy and bland, even if my mom was right that the taste was inoffensive. But the real shocker for me was that, without moisture, the grilled tilapia formed a gorgeous crust and was moist and flaky, but firm and a little crispy on the outside. Best of all, it barely even tasted like fish; more like some amazingly light protein with the slightest whiff of brine. And I do love the salty and the briny, so I figured there were a number of ways I could translate this grilled fish to other dinners. When I got home from my parents’ house, I put the plan into action immediately. Now that I knew what I was doing, I wanted to find easy, quick dinners to which I could add tilapia. Always, it cooked up firm, moist, and a little crispy on the outside—perfect with a robust side of veggies, or in a fish sandwich, and just as nice with curry powder and coriander, served with basmati rice, as it was with thyme and red pepper flakes, served with hummus, pita, and a kalamata olive tapenade. Truth be told, though, my real hope lay elsewhere. Once, years ago, I’d had one bite of fish—just one, but I still remembered it—that I actually, actively liked. It was a bite of a fish taco that I took, really, just to be polite. Shock: it was delicious, but I wasn’t sure why. So: my true goal? Make a fish taco that’s filling and delicious, but not too time-consuming to whip up for dinner after work. I looked around at a number of recipes, but they all seemed fairly blah. Until I began to see recipes for my holy grail of flavor combinations: mango and avocado. 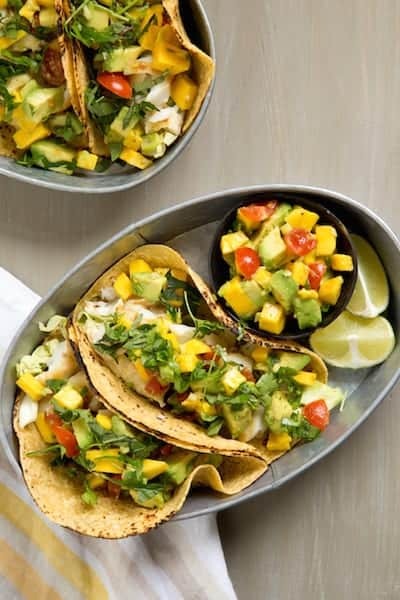 The second I got wise to mango avocado salsa (yes, I know, way late to the party, but so glad I showed up), my fish tacos became magic. When I made the first batch I was struck, before I ever tasted them, by how gorgeous they were: a riot of red, yellow, green, and orange that I couldn’t wait to eat. And, yes, they were everything I hoped they would be. Now I make fish tacos at least once a week when it’s warm out. And (spoiler alert) I’ve used tilapia as a gateway drug and moved on to salmon, which is also wonderful in these tacos. 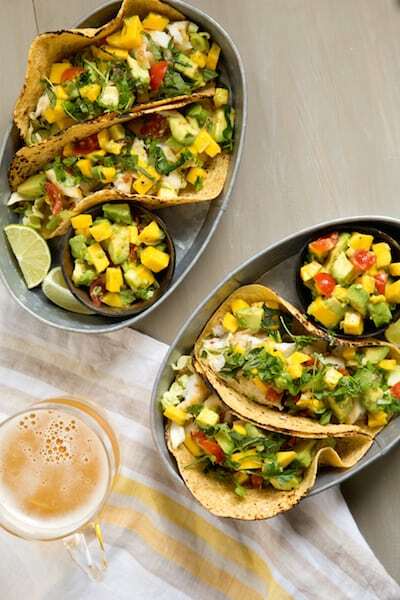 A quick note on tilapia: when you’re looking to buy your fish for these tacos, it’s a good idea to look for tilapia that’s farmed in the U.S., Canada, or Ecuador. Tilapia farmed in China and Taiwan is not as recommended because of the chemicals used to farm it there as well as waste management practices. As always, it’s best to use tilapia from farms that are certified as sustainable. Whisk the lime juice, 1 teaspoon olive oil, sliced chili, and garlic in a shallow bowl big enough to fit your fish. Marinate the fish, flipping it every once in a while to get flavor on both sides, while you make the salsa. Heat a grill pan or heavy-bottomed pan like a cast iron skillet over medium-high heat. Brush the grill pan with the remaining 1 teaspoon oil or add the oil to the non-ridged pan, if using. Pat the fish dry between a few paper towels so it will grill rather than steam, then sprinkle salt and pepper on both sides of the fish. Cook the fish, flipping once, for 3-4 minutes per side. 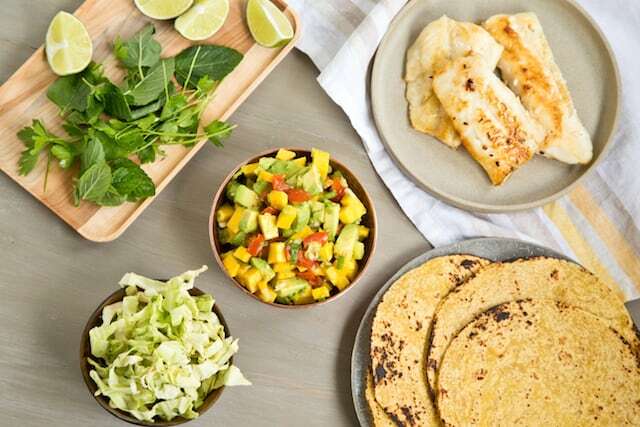 Assemble your tacos: cabbage on the bottom of the tortilla to keep it from getting soggy, then half the fish chunked into each tortilla, then a generous helping of salsa, and finally your fresh herbs. This is a meal so simple, fresh, and colorful that once you make it, you’ll never go back. And that’s convenient, because you still have half your salsa in the refrigerator for tomorrow.